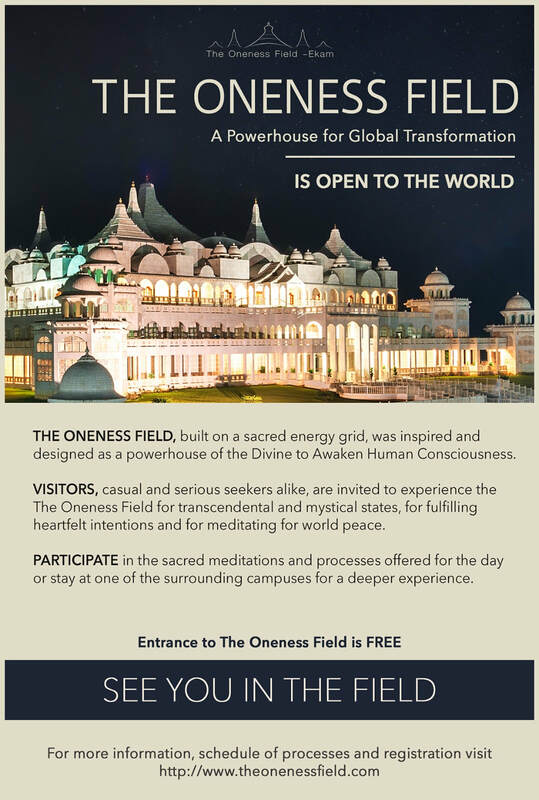 The Oneness Field / Ekam - Oneness New Jersey . . . Awoke feeling very serene and peaceful in the morning, and this inner peace effortlessly continued and deepened throughout the day as we did the meditations in Ekam. During instruction for Mukthi Upasana (final meditation for the day) we were informed that Inner Stillness is the intention for today's deeksha from the Golden Orb.. things started to click in my understanding as to why this effortless peace all day. As I engaged in the instruction throughout the final meditation/Upasana the stillness deepened and deepened. We were told to saturate our attention in the sounds, and they played what sounded like a recording of Tibetan singing bowls which echoed beautifully throughout the temple. The stillness became inner silence, and then the music changed to a bubbling stream. I became aware that the boundaries of my torso and chest region were boundless..and it literally felt like the stream was running thru the center of my heart.. it was very blissfull and I was in complete peace, at one with the sound of water bubbling thru me. I felt like nature would, completely holding space for life to flow thru it. It was incredible, yet so tranquil and peaceful and natural to be in such perfection. They then told us to bring our attention to the space in front of our forehead and to connect with the Golden orb. As my attention moved there I immediately saw pure golden light.. I don't SEE often but this light was brilliant and was pouring into me, saturating my brain with as much light as I could possibly take. I felt my Kundalini quickly raise thru the back of my head in response and it felt like for the next many minutes, that the body did its very best to meet and receive the abundant power and grace that was being poured into it from this Golden light that seemed to engulf my whole head. It was very intense in the magnitude of power that I was experiencing, as well as what felt like being held and met in pure light and love. All I could do from the small will left within the silence, was to pray to soak up as much light as possible because the Golden orb has come! Afterwards as I lie in Savasana, for the first time I had the realization that the Golden orb works out of the Physical Golden Ball like an access point, which is now housed in Ekam full time, in the center of the top floor inside the Sri Chakra. My experience in the past from receiving hands on blessing from the Golden ball and meditating in its presence was always peaceful and beautiful but not something that I felt effected me profoundly. But since this experience a strong connection has been made between myself, the golden ball, and the Golden orb of divine grace. I now understand that the physical golden ball is like a physical anchor. It anchors the phenomenon of the golden ball of grace, so that it can be readily available to help us in a very powerful and accessible way. I have a new relationship with the physical golden ball now, and it is one of deep reverence. I see that Sri Bhagavan has poured his divine life's work, intention and consciousness into it, and has left it in Ekam for all to be blessed by. This physical golden ball is a gateway to the golden ball of grace of which form is limitless and powerful beyond comprehension. I am very grateful for this experience and for what has been made available to us at Ekam. I feel it is an incredible chance, and likely the best chance, that we have been given, to grow as individuals, and as a collective family, very quickly into much needed higher states of consciousness. My experience last night day 6 and how it’s being here ..
During the meditations I was going very very deep at times knocked out. Then again I’m inside another huge Temple in another realm this time I’m taken all around the gardens and grass areas which were so beautiful and then inside I saw the Golden Orb was up at the top of a huge staircase leading to it.. Also another room that was shaped like a dome that the door opened up and you could go inside like a chamber of sorts.. It was very big..
Also the O&O has made the whole process easy for us and very comfortable with nice seating cushions and easy clear instructions.. they also are so available for any questions and concerns .. It’s so evident O&O wants to make this experience wonderful for everyone .. There is construction going on to make all accommodations nice and pretty no matter what campus you decide to stay .. The food is wonderful !!! They hired a baker for making us nice treats that shortly will be for sale at Cafe Yogi.. The entire Amma shop is being redone and clothing made of nice cotton and linens .. This is quite amazing how much effort is being made by so many wonderful people to make O&O Academy a place of comfort for all who come !!!! My thanks to Sri Amma Bhagavan for giving us this opportunity and his son Sri Krishnaji and the beautiful Sri Preethaji for undertaking the enormous transformation of not only the Campuses and Structures but also for loving humanity so much that they both spend every waking moment helping us transform quickly .. The guides here are open to suggestions , so so kind and loving and available to listen to us.. This 7 days has been transformational for me .. I’m forever grateful and can not wait to come back !!! I am just back from Ekam and want to share the experience. I spent three days there and they were completely filled with the most exquisite and beautiful experiences I ever had during all 15 years of being in Dharma. These three days at Ekam were so subtle and profound, and complete that I can surely say that being there will satisfy the taste of any profound seeker and certainly will transform and fill with Grace any curious visitor. Upasanas are designed so perfectly, they have everything in them, bhakthi, sadhanas, meditation, observation, contemplation, dance, literally everything and in a such harmonious manner that any person of any walk of life and any religion, and any culture attentively participating can find the resemblance. So my personal experience was that I have been purified, washed off many heavy emotions and charges that I was feeling. After three days processes at Ekam, my body feels light, my emotions positive and my mind sees everything in a beautiful manner. It is not any positive thinking tools like affirmations or else, it is purely mystical happening, a true transformation because during these three days, I was not taught any affrimations or general positive thinking tools, and yet, I feel so light and so positive and clear, like i never felt before. Another wonderful gift is that my heart opened even more, I realized and finally accepted that I do care for my friends, and even if I may get upset and angry with them, I still love them and very much care for them. There is not fear to care, and that care does not come as a general responsibility to care, it is a real feeling, very joyful, very light and has no expectation of a recognition. Another thing is that the group of ppl with whom I meditate daily was feeling a very strong flow of energy while I was at Ekam, which as my opinion confirms that if you go there and stay for few days, your personal transformation will affect all those who connected to you: family, friends, dear ones all will get the benefit. So no doubt it is very effective to be at Ekam and I would encourage to go there and stay for more than just one day, I would say to stay at Ekam for a week or so, because every next day the effect is more profound, more subtle, more effective. With all ability of my heart, I am expressing the deepest gratitude for this vision, for this happening, for Ekam, and for letting me to be part of it to my beloved Sri Amma Bhagavan and Sri Krishna ji and Sri Preetha ji. At your lotus feet, eternal gratitude. Listening to the video recording of Sri Bhagavan’s words during the opening of the EKAM process , my heart was set on fire. Not willing to wait for a convenient time, tickets were booked and bags were packed. Determined was I , to come to The Oneness field – Ekam to capture the Golden Orb in my heart to encase my Divine( Sri AmmaBhagavan) who was already comfortably perched . On the very first day, when asked to invite the Golden Orb into my heart, little did I realize what awaited me. The Golden Orb came into my heart and without any warning punched me with a super high voltage electrical left hook that knocked me down flat on the floor. I had a blackout entering into a field of nothingness, emptiness and silence. Time and Space were left behind. This lasted for a few moments and I came back at 7 before the countdown ended, dazed but ready to enter the next round of duel. Being basically a reserved and closed person by nature, I had built a fortress around me and appointed a Self-centered security guard as barriers to prevent entry for any relationship including that with my spouse. My unconscious was the mischievous de facto controller of my life and had plenty of stories to tell me about my unresolved emotions, desires and conflicts and I existed like a Don Quixote in a bubble of illusions and suffering. On another day, when asked to pray to the Golden Orb to remove hindrances/obstacles of my life, I pitted the above and prepared for battle. The Golden Orb turned into a huge Demolition ball with chains and started tearing down and in no time demolished my fortress all around me. Before I could raise the peace flag, the Golden ball with chains lost no time in coming after me and blasted me to smithereens leaving no trace of remains. Out emerged a beautiful multi-colored bird in a Golden bubble floating away free and flying away. Then the bird turned Golden and started expanding the self until the whole planet was covered. Not stopping here, it expanded furthermore into the Cosmos until the whole universe was engulfed and embraced. Later that day, I asked the Golden Orb that I would like to receive the Sacred Presence. I could see that from my golden lotus form emerged a Siva Linga (a Divine form of Hindu tradition) black in color decorated with Siva namam and grew in size considerably and received abishekam ( a hindu ritual) of milk and honey from high above. This was replaced with Sri AmmaBhagavan and all Hindu Gods and Goddesses that I worshipped in my lifetime . I was then transported in a guided tour of the scenic mountains with wildlife abounding, then into the desert with complexes of sand dunes and finally into the depths of the ocean with hordes of fishes swimming in zig-zag motions , all of which pointed to the sacred presence in varied forms of divine expression . When the tour ended back to the EKAM meditation field, I could see every other participant were all cloned in the same divine form of a Siva Linga that I saw in myself, giving me the insight that every other human form has the same divinity that is in me and we are all ONE or EKAM. On the final day, during Parishkara siddhi (prayer for removal of hindrances/obstacles in my life), I prayed for the removal of incessant thoughts pervading my racing mind and constant struggle from inside me as well as hindrances blocking my service towards Oneness. I offered in the sacred fire of the havan kund (receptacle fireplace) burning in me, all my uncontrollable diseased thoughts, dysfunctional emotions, desires and conflicts arising from my unconscious and the internal struggle that dominated all my adult life. I could immediately see 7 golden bubbles each containing my parents, grandparents, great grandparents and so on connecting me in a straight line with umbilical cords. The first connected me with my parents and the second connected my parents bubble with another umbilical cord from their behind to their parents (my grandparents) and so on. I could only see and recognize the first 3 bubbles upto my great grandparents though the other 4 signified my ancestral lineage. The Golden Ball inside me turned into a pair of a big Golden shears and cut the umbilical cord attaching me with my parents and then went behind them and cut their umbilical cord with my grandparents (their parents) and further continued to cut all 7 cords until all seven bubbles were liberated and freely floating independently. After this, I saw that my brain structure rose to take the shape of a dark tree filled with dark birds (thoughts) and dark leaves (conditioning, programs and charges). In no time, the darks birds flew away as the tree turned golden and the dark dry leaves fell to the ground. In their place, golden leaves emerged, and golden birds filled the branches, all in the shape of a Kalpavriksha, the Golden wish-fulfilling Divine Tree. In the next session of Upasana (an intense kind of systematic meditation), in the prayer for the third eye chakra activation, my entire body started shaking and assumed the form of a Shiva linga (a hindu divine form), my head then turned into the face of Shiva (a hindu deity) with the namam (white clay or ash smeared across the forehead) and bearing the crescent moon among locks of hair flowing in the wind and divine water rising and falling like a fountain. In the region between my eyebrows in the forehead, I could see a divine fire raging. As the meditation progressed, I could see the golden ball push the golden snake form from the base of my spine upward all the way to the crown chakra. The Golden snake form raised and spread its hood above my head in a grand spectacle and then completely covered my scalp with its hood. During the Sankalpa Siddi (prayer for boons), as I asked for Inner Stilllness, Surrender and for Seva (Service) towards the Vision for ending suffering of humanity, I could see brightly the divine fire raging between the centre of my eyebrows turned into a still candle-like flame encapsulated within a golden oval shaped orb. The Golden Ball inside me turned into the shape of a Kalasha (a symbol of auspiciousness) and brought waves of joy and sacredness inside me. The WORD of Sri Bhagavan during the video recording of opening ceremony of EKAM which had lit the sacred fire inside me, now pervaded my entire being and every cell of my body was filled and glowed with HIS Presence inside the Golden Orb. I could see myself in the external world wherever I may go, every word that came out of me was lit with the same sacred fire and conquered hearts by spreading this light. As I walked, the very dust that I raised turned golden, my arms and body movements lit up the molecules around me and they spread far and wide. My every breath sourced from the Golden Orb within, cleansed the polluted atmosphere outside. My heart shouts with joy as I proclaim - KALKI’S (Golden Orb Sri AmmaBhagavan) WORD IS MY SWORD.